Gordon Brown has revealed in a new memoir how he feared he might completely lose his eyesight during his third year in Downing Street. The then-prime minister, who has been blind in one eye since his teens, told how he tore a retina in the other eye. He did not tell colleagues and tried to carry on with his cabinet duties despite not being able to see properly. He also writes about his struggles with "touchy-feely" modern politics and what he got wrong, and right, as PM. "When I woke up in Downing Street one Monday in September (2009), I knew something was very wrong. My vision was foggy," writes Mr Brown in My Life, Our Times. "That morning, I was to visit the City Academy in Hackney to speak about our education reform agenda. I kept the engagement, doing all I could to disguise the fact that I could see very little - discarding the prepared notes and speaking extemporaneously. "Straight afterwards, I was driven to the consulting room of a prominent surgeon at the Moorfields Eye Hospital in London." Surgeons discovered the retina in his right eye was torn in two places. They eventually decided not to operate, writes Mr Brown, who had lost the sight in his left eye following a teenage rugby accident. "I am grateful that the (right) retina has held to this day and I feel lucky beyond words," he writes. Downing Street released a statement at the time saying there had been "no change" in Mr Brown's eyesight and his visit to the hospital had been "part of regular checks on his eyes and this check was also fine". 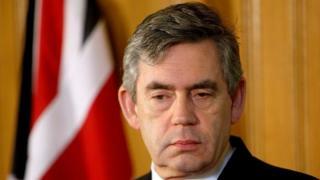 Mr Brown, who took over as prime minister from Tony Blair in June 2007, without a Labour leadership contest, also writes about his regret that he could not convince voters of the need for "radical" reforms in the aftermath of the 2008 financial crisis. Referring to his decision to bail out the banks and co-ordinate international recovery efforts, he says: "We won the battle - to escape recession. But we lost the war - to build something better. "I fell short in communicating my ideas. I failed to rally the nation around the necessary fiscal stimulus and my plans for radical change. "Banking should have been transformed, our international institutions refashioned, inequality radically reversed - and if we are to be properly equipped to face the next crisis this is still the agenda we must pursue." Mr Brown, who lost power in the 2010 general election to a coalition government headed by Conservative leader David Cameron, also writes about his struggles with social media and personality politics. "The modern version of 'connecting' seems to increasingly include a public display of emotion, with the latter - authentic or not - seen as evidence of a sincerity required for political success," he writes. "In a far more touchy-feely era, our leaders speak of public issues in intensely personal ways and assume they can win votes simply by telling their electors that they 'feel their pain'. "For me, being conspicuously demonstrative is uncomfortable." He says he managed to keep his two sons out of the media spotlight and resisted pressure during his time in politics to "cultivate an image that made the personal constantly public - reticence was the rule". He also uses the book - to be published next month - to take a swipe at social media, saying: "During my time as an MP I never mastered the capacity to leave a good impression or sculpt my public image in 140 characters. "Now no politician can succeed without mastering social media - and yet, in it, the prime minister becomes one among millions of voices competing to be heard." He says he "fully understands" the need to "lighten up to get a message across" and accepts that "in the second decade of the 21st Century, a sense of personal reserve can limit the appeal and rapport of a leader". But he adds: "Really, to my mind, what mattered was not what I said about myself, but simply what our government could do for our country."